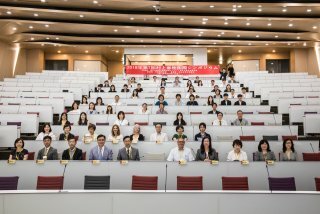 Haruki Murakami International Symposium "Writing History"
TAMKANG UNIVERSITY – A closing ceremony held at Shou-Chlien International Conference Centre on 27th May 2018 marked a very successful end to the 7th Haruki Murakami International Symposium 2018 organised by Center for Murakami Haruki Studies of Tamkang University. In addition to three heavyweight scholars – Mr Miharu Nakamura (Hokkaido University), Mr Satoshi Kinsui (Osaka University) and Mr Matthew Strecher (Sophia University), over 300 Haruki Murakami Literature Researchers from all around the world gathered in Tamkang University presenting over 50 research papers. The opening ceremony started with the Dean of the College of Foreign Languages Ms Lucia Chen first addressing the opening ceremony and welcomed all guest scholars present. The opening ceremony was then followed by speeches gave by Mr Kazuki Matsubara (Japan-Taiwan Exchange Association), Mr Chen-Nan Lai (Dean of College of Foreign Language, Fu Jen Catholic University; Director of Japanese Language & Literature Association of Taiwan) and Ms. Chiu-Kuei Tseng (Head of Department of Japanese, Tamkang University; Director of CMSTKU). The Director also noted that as the world's only Center for Murakami Haruki Studies, almost all heavyweight scholars in the field of Haruki Murakami Studies from around the world are invited to the symposium, the fact that we maintained the scale of the organisation and convening the symposium for 7 years in consecutive between Taiwan and Japan, we are in fact "writing history". The theme for this year was "Sympathy in Haruki Murakami's Literature". Speeches, thesis poster presentation, oral presentation, the Asian premiere of "Dreaming Murakami" as well as a roundtable forum was planned for the course of the symposium. Oral Presentation commentator for each oral presentation session was assumed by outstanding scholars in the field. The person in Charge for Department of Filmology and Cultural Studies of Representation, Graduate School of Letters, Hokkaido University, Mr Miharu Nakamura confirmed that the 8th Haruki Murakami International Symposium 2019 is to be held in Hokkaido University. Mr Nakamura also confessed that he feels stressful after witnessing the course of the symposium, worrying that Hokkaido University would not be able to provide a similarly magnificent venue like Shou-Chlien International Conference Centre, nonetheless, he sent his warm invitation to all guests present to join the symposium next year. Numerous guest scholars have been attending the symposium as an annual established schedule. American professor from Sophia University noted that "I like Taiwan so much". Professor Satoshi Kinsui has also been delightful during the course of the symposium despite being known as unsmiling. First-year Graduate student Man-Chen Dou who was also present at the symposium also expressed her delight for being able to join the symposium in the thesis poster presentation section. Besides, she also noted that being able to get to know numerous scholars that she likes has given her the motivation to continue her research. She expects to write a graduate thesis around the theme of Haruki Murakami Studies.